Repealing the death penalty in Illinois was deemed a long shot by most everyone, but that didn't stop the Illinois Coalition to Abolish the Death Penalty. Repealing the death penalty in Illinois was deemed a long shot by most everyone, even though the state had a 10- year moratorium in place on state-sponsored executions. That didn't stop the Illinois Coalition to Abolish the Death Penalty. Mac Strategies Group, a firm experienced in handling advocacy issues, built a campaign around the coalition's assertion that the "death penalty system is broken beyond repair" and costly to taxpayers. The repeal bill before state legislature squeaked by with a win. On March 9, Gov. Pat Quinn (D) signed it into law. "We would not have succeeded without Mac," says the coalition's executive director Jeremy Schroeder. "We used a 'dimmer [switch]' campaign: We didn't turn the switch on at first," says Ryan McLaughlin, Mac Strategies CEO. "When it was time to vote, we turned on the lights." By that McLaughlin means his team initially worked be-hind the scenes, meeting with journalists, creating talking points, and collaborating with the client to draft and place opinion pieces and letters to the editor. 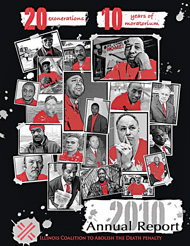 Mac Strategies developed messaging to illustrate why it was time to abolish the death penalty; kept the coalition on point to lessen opponents' criticism; and coordinated news conferences in Chicago and Springfield, IL, to kick off an aggressive legislative push for abolition. The campaign secured 21 editorials calling for abolition in the state's largest newspapers. The coalition remains vigilant, as the law could change again. In March, Rep. Dennis Reboletti (R-IL) introduced a bill to reinstate capital punishment for "worst of the worst" criminals.